Chris Mooney of the Washington Post is out with an article on the activist letter we recently critiqued here. Mooney deserves credit for including a balanced perspective on the science underlying the carbon benefits of biomass and the language of the congressional amendment that reflects those benefits. 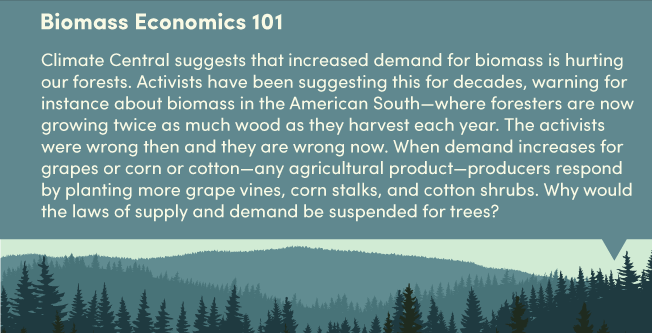 But the article might still leave readers believing one of the core myths of anti-biomass dogma—that trees take “a century” to grow back after harvesting. This is wrong coming and going. 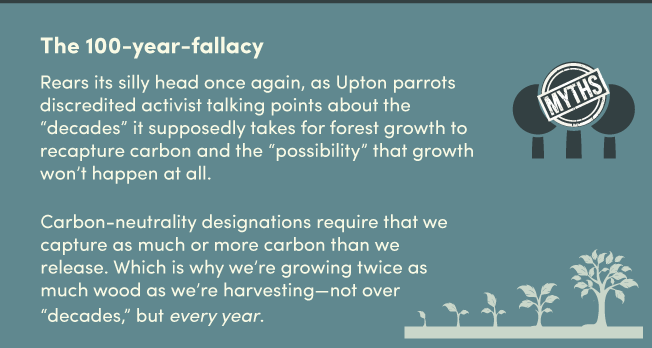 Not only is it false that it takes a century to regrow trees after harvest—responsible forestry doesn’t work that way, for reasons we outlined here—but 100 years is precisely the timeframe that most climate experts recommend for a robust assessments of carbon trends in the atmosphere. Indeed, it’s the same timeframe that climate scientists themselves use to measure the impact of fossil-fuel derived greenhouse gases. So why does a group that includes several climate scientists get away with a double standard when it comes to biomass—which, unlike fossil fuels, is a fully-renewable resource and an ingenious carbon capture technology in its own right? That’s in line with the thinking of the UN IPCC, and the 100+ forestry scientists that Mooney himself cites in the piece. So it does readers a disservice to give credence to alarmist spin that isn’t supported by sound science. There’s also another irony at work. Just hours before Mooney reported on the activist letter, he put out a long, thoughtful piece on researchers looking for viable means to pull carbon out of the air. What is perhaps the number one challenges to these efforts, according to Mooney? Economic viability. Mooney reported that one such project to pull carbon out of the atmosphere could cost between $60 and $600 trillion—yes trillion. And yet if you were to imagine a substance that taps into the natural carbon cycle, pulls CO2 from the atmosphere naturally and efficiently, and taps into a viable, renewable energy source that is a viable replacement for fossil fuels in many contexts—you’d be imagining forest biomass. As we wrote in response to the misguided activist letter, healthy biomass markets mean healthy forests. Even as we speak, the laws of supply and demand, combined with smart, responsible forestry, are working to help solve our energy problems and our climate challenges. Anti-biomass would better serve their donors, and the planet, by pausing to reflect on their misguided opposition.